F/A-18C Hornets assigned to the U.S. Navy Flight Demonstration Squadron, the Blue Angels, perform an aerial demonstration during the Naval Air Station Jacksonville (Fla.) Air Show. 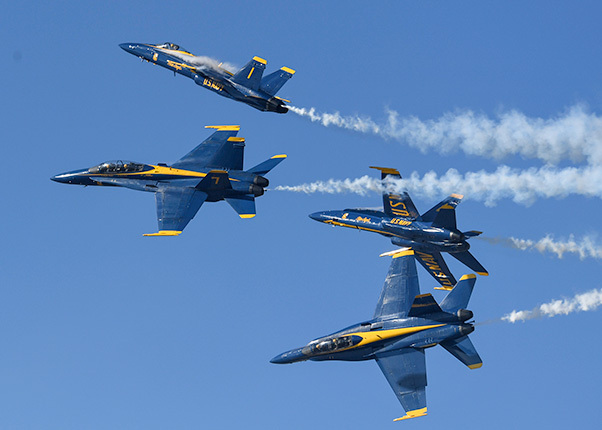 The show celebrated the Blue Angles’ heritage, which traces back to 1946 at the squadron’s birthplace of NAS Jacksonville. The show also featured aerial performances by other military and civilian flight teams, live entertainment, and the opportunity to see military aircraft and vehicles and the U.S. Special Operations Command Parachute Team. The U.S. Navy Flight Demonstration Squadron, the Blue Angels, announced updates to the 2018 air show schedule and released the 2019 air show schedule at the International Council of Air Shows convention, Dec. 4, 2017. * The show in Tucson, Arizona, has been cancelled (March 17-18). * A show in Myrtle Beach, South Carolina, has been added. (April 28-29). * A show in Minden-Tahoe, Nevada, has been added. (Oct. 13-14). 16 — Naval Air Facility El Centro, Calif.
30-31 — Naval Air Station (NAS) Key West, Fla.
27-28 — Marine Corps Air Station Beaufort (MCAS), S.C.
4-5 — Fort Lauderdale, Fla.
18-19 — Cape Girardeau, Mo. 22 — U.S. Naval Academy, Annapolis, Md. 15-16 — Ocean City, Md. 13 — Pensacola Beach, Fla.
27-28 — Grand Junction, Colo.
24-25 — New Windsor, N.Y.
21-22 — NAS Lemoore, Calif.
28-29 — MCAS Miramar, Calif.
26-27 — Moody Air Force Base, Ga.
2-3 — Jacksonville Beach, Fla.
8-9 — NAS Pensacola, Fla.
For information about individual air shows, please go to each air show’s official website. For more information about the Blue Angels, including the 2018 and 2019 air show schedules, visit http://www.blueangels.navy.mil.